Last week's four-day rally, which was driven by hopes of easing in trade tensions between the US and China, fizzled with US equity futures mixed, stocks in Europe struggling for direction and Asian shares declining on Monday as concerns over another poor Caixin Service PMI report out of China and rising US interest rates dampened risk appetite while optimism over a potential America-China trade deal receded as investors shifted focus on the US midterm elections Tuesday and the Fed's rate decision later this week. Asian stocks dropped as skepticism over the outcome of the trade dispute between the U.S. and China persists. While Chinese President Xi Jinping hit back against President Donald Trump’s “America First” policies, he didn’t outline any new proposals that would suggest he was prepared to meet Trump’s demands in his much-anticipated speech today. Meanwhile Berkshire Hathaway rose in pre-market trading after operating profit doubled in the third-quarter and the company bought back almost $1 billion in stock in a rare repurchase. European telecom and utilities companies were among the biggest advancers as the Stoxx Europe 600 Index eventually edged up, though futures on the Dow and S&P 500 were slightly weaker. Major European indices are mixed, with Spain’s IBEX 35 (+0.5%) leading the gains, and Italy’s FTSE MIB (-0.4%) lagging as the index is weighed on by local banking names such as Banco BPM (-2.5%) and Intesa Sanpaolo (-2.0%) following the release of stress test results, which showed the former as the worst performing Italian lender following a slump in the nation’s bonds amid political turmoil, while Goldman Sachs analysts predicted more cuts to earnings forecasts for Italian lenders, cutting BPER Banca and Intesa Sanpaolo to “sell”. Furthermore, Barclays (-0.1%) and Lloyds Banking Group (-0.8%) were amongst the worst performers due to weak growth, credit losses and Brexit uncertainty. Earlier shares in Asia slid following Friday’s rally and after White House economic adviser Larry Kudlow downplayed the potential for a quick deal with China and denied Washington has drafted a trade agreement with Beijing. MSCI’s index of Asia-Pacific shares ex-Japan lost 1.2% percent, slipping back toward last week’s 18-month trough. Also overnight, President Xi Jinping acknowledged conditions abroad had created some challenges for the Chinese economy, but promised to lower import tariffs and continue to broaden market access. The Shanghai Composite dropped as much as 2% before recouping most losses by the close. U.S. stock futures were down as much as 0.3% in early trading amid concerns a trade deal between the United States and China may not be struck soon, before recovering much of their losses. 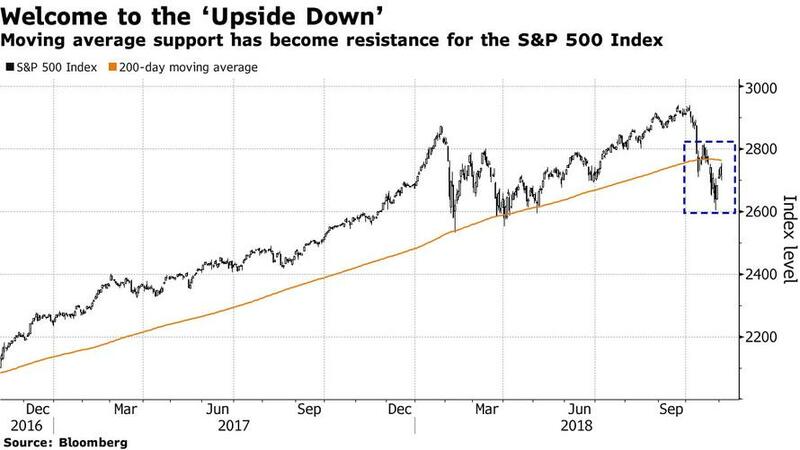 "After a four-day rally people tend to become a bit exhausted - and just generally I feel like everyone’s on hold until the (end-November) G20 and also the Fed coming up,” said Gregory Perdon, chief investment officer at Arbuthnot Latham. At the same time, the S&P's critical 200DMA support level has now become resistance. With the Federal Reserve meeting on Wednesday and Thursday, the prospect of even tighter U.S. monetary policy after strong economic data is also on investors’ minds, pushing emerging market lower by 0.9%. Markets are now pricing in a higher probability of a December rate hike with further tightening to 2.75-3.00% seen through 2019. Tighter monetary policy, a stronger dollar, and trade tariffs have created what Citi strategists call “Trump’s triple tightening” this year. “This ...has slowed growth and raised risks around the world,” they wrote. The British pound briefly jumped to a two-week high on hopes of a Brexit deal, before paring gains to trade up 0.2% at $1.2990. Over the weekend, A Sunday Times report that an all-UK customs deal will be written into the agreement governing Britain's withdrawal from the European Union drove the pound its highest since Oct. 22. Enthusiasm fizzled, however, after May’s office said the report was speculative, even as it noted that 95% of the withdrawal agreement was settled and negotiations were ongoing. Elsewhere, the yen barely moved after BOJ Governor Kuroda hinted Monday that he wants to normalize monetary policy once the central bank gets closer to its price goal. The dollar consolidated at the start of an event-packed week in the U.S. that features midterm elections, a Federal Reserve meeting and $83BN auctions on 3- to 30-year maturities. Treasury yields eased back ever so slightly after rising on Friday. Italian bond yields rose, driving bank stocks down 1.8%. Crude was on track for a sixth day of declines even as sanctions on Iran oil snapped back into place Monday although softened by waivers that will allow some countries to still import Iranian crude, at least temporarily. Markit Services PMI and ISM Non-Manufacturing Index are expected on the macro side. Earnings include Marriott International, Avis Budget and Ferrari among others. Asian equity markets began the week with a negative tone after last Friday’s losses on Wall St where the Nasdaq underperformed after tech giant Apple dropped nearly 7%, while sentiment was also dampened by soft Chinese Caixin PMI data and after US-China trade hopes were tempered by pessimism from NEC’s Kudlow. ASX 200 (-0.5%) and Nikkei 225 (-1.5%) were both pressured from the open although stocks in Australia briefly recovered in tandem with the price swings in its largest weighted financial sector as participants mulled over Westpac’s flat FY profits, while focus in Japan remained on corporate updates including index heavyweight Fast Retailing which slumped following a 10% decline in same-store sales. Elsewhere, Hang Seng (-2.4%) and Shanghai Comp. (-1.0%) were negative after US administration officials downplayed prospects of an imminent resolution to the US-China trade dispute and with Chinese Caixin Services and Composite PMI at the weakest since September 2017 and June 2016 respectively, while the PBoC Medium-term Lending Facility announcement and President Xi’s pledge to further open up China’s economy only helped plug losses momentarily. Finally, 10yr JGBs were marginally higher as the risk averse tone spurred demand for safety. This helped prices recover from Friday’s declines which coincided with a sell-off in T-notes and a surge in US yields by the most in the month following the NFP-beat. Major European indices are mixed, with Spain’s IBEX 35 (+0.5%) leading the gains, and Italy’s FTSE MIB (-0.4%) lagging as the index is weighed on by local banking names such as Banco BPM (-2.5%) and Intesa Sanpaolo (-2.0%) following the release of stress test results, which showed the former as the worst performing Italian lender following a slump in the nation’s bonds amid political turmoil. Furthermore, Barclays (-0.1%) and Lloyds Banking Group (-0.8%) were amongst the worst performers due to weak growth, credit losses and Brexit uncertainty. Moving on, major sectors are mixed with utilities (+0.6%) and consumer staples (+0.6%) outperforming, while industrials are lag (-0.5%). In terms of individual equities, GAM (+2%) shares are in the green after being approached by Schroders (-1.6%) regarding a potential acquisition; which sources say GAM rejected. On the flip side, Hiscox (-7.3%) are lagging in the Stoxx 600, after their earnings showed a substantial increase in written premiums. In FX, the broad Dollar has lost some of Friday’s post-NFP recovery momentum ahead of the US mid-term elections and FOMC, but the index is holding relatively firm around 96.500 as major pairings trade somewhat mixed. GBP/NZD - Vying for top spot amongst G10 rivals, and perhaps surprisingly or unexpectedly as the Pound recovers from another UK PMI miss, and from the major services sector. However, Cable is back above 1.3000 from a knee-jerk dip to circa 1.2970 and still benefiting from latest press reports suggesting the EU has made concessions on the Irish border and customs front, albeit someway off high just over 1.3060 at one stage. Similarly, the Kiwi has rebounded firmly from overnight lows on the back of a pretty downbeat NZ Treasury business survey revealing a further deterioration in sentiment over Q3 and risks to the growth outlook for 2018 and next year due to global trade spats. Nzd/Usd back up around 0.6665 vs 0.6635 at worst, with cross-winds also helping as AUD/Nzd remains anchored near 1.0800 and Aud/Usd struggles to climb through 0.7200. EUR/CAD/JPY/CHF - All underperforming vs the Greenback, with the single currency capped around 1.1400 and still wary about another Italy vs EU face-off on the budget, while the Loonie straddles 1.3100 after last Friday’s NA jobs data (Canadian not as upbeat as US, largely on soft wages) and ahead of a speech by BoC Governor Poloz. Usd/Jpy has nudged further beyond 113.00 and soaked up offers/hedges vs a modest 113.25 option expiry and the Franc is back under parity within a 1.0020-55 range. EM - Regional currencies are broadly weaker vs the Usd with the Yuans undermined by less encouraging US-China trade vibes and weak Chinese PMIs, while the Try is pivoting 5.4500 in wake of Turkish inflation data showing a further rise in CPI. In commodities, WTI (-0.3%) and Brent (-0.1%) are just off session lows with choppy trade experienced in the complex following the implementation of oil-related sanctions on Iran by the US. Iranian President emerged stating that Iran will sell oil and break sanctions, while he added that Iran is open to talks with the US once President Trump respects commitments. Temporary exemptions are being granted to eight countries making the sanctions less severe than anticipated, additionally removing the risk of a supply shortage according to FXTM strategist Hussein Sayed. Furthermore, Iranian press noted that the terms of the Special Purpose Vehicle (SPV) with the EU will be announced soon. The SPV is the European effort to process Iran’s import and export payments. Diplomates said the details are being discussed by finance ministers, with EU Finance Ministers due to meet in Brussels on Tuesday, although the SPV was not on the agenda as of Sunday. Gold (+0.1%) is flat and off of session highs as the yellow metal mirrors USD moves. Elsewhere, copper prices pulled back on profit taking and amid the averse risk tone. Tomorrow’s US mid-term elections are the focal point for the week. My EMR colleague Quinn Brody wrote a preview note last week highlighting that polls and betting markets indicate that the Democrats are likely to take control of the House, while the Republicans are likely to retain Senate control. The major issues for voters are healthcare, immigration, and trade policy. For markets, the key issues are whether to expect further fiscal stimulus, and what the implications are for trade policy. On the former, unified Republican control is likely more bullish, while on the latter, a divided government could de-escalate the current trade conflict. Either way, our US strategists are unlikely to be swayed from their bullish equities and bearish rates view. Our US equity strategists have written extensively on how markets have historically rallied around midterm elections, though this is equally due to historic coincidence (growth has tended to be strong around elections) as the actual elections. That said they expect this scenario to repeat. Staying with politics Mr Trump is meeting Presidents Macron and Putin on Friday which could generate headlines while in Germany the CDU party retreat at the weekend could provide headlines today and an update from the party on future leadership directions. Away from that we've also got a Fed meeting with no press conference (Thursday), more global PMI data (today and tomorrow), US PPI (Friday), China trade (Thursday) and inflation data (Friday), and more corporate earnings scheduled. The weekend news of most note was the UK Sunday Times claiming that PM May has secured concessions from Brussels to allow all of Britain to stay in a customs union with the EU and thus avoid a hard border in Northern Ireland. There have been a lot of Brexit stories in the press of late that have had limited substance but to be fair this potential breakthrough was starting to appear on the wires at the back end of last week. Indeed DB’s Oliver Harvey published a note on Friday looking at the scenarios around a deal that kept a UK wide customs union before a permanent trade deal could be agreed. He has dubbed this 'Brexiternity'. See his note here for more details. We could hear of progress this week as the UK formally responds to the latest EU proposals on the UK-wise backstop. Indeed there is a UK cabinet meeting tomorrow to discuss the latest developments. Before we relax and think Brexit is running more smoothly we should add that overnight the UK Telegraph has slightly confused the message from the Times article suggesting that the UK Brexit Secretary Dominic Raab has privately demanded in a letter to Mrs May that Britain reserve the right to pull out of the future EU’s Irish backstop after just three months. So uncertainty over where we are will linger. Sterling is up +0.12% in early trade this morning but was up around 0.7% before the Telegraph story filter through. 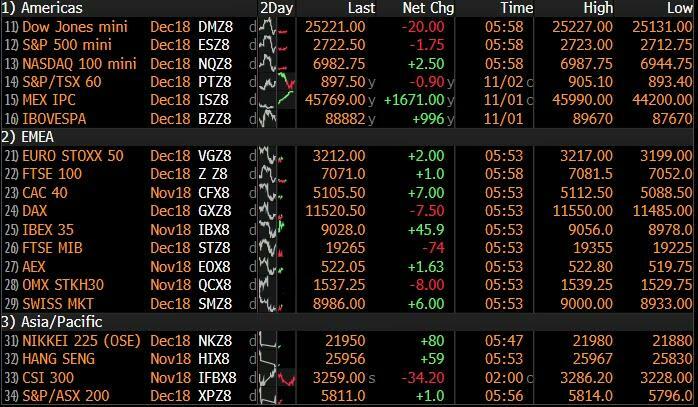 The week has kicked off with a risk off note in Asia with the Nikkei (-1.32%), Hang Seng (-2.65%), Shanghai Comp (-1.00%) and Kospi (-1.40%) all down along with most Asian markets. 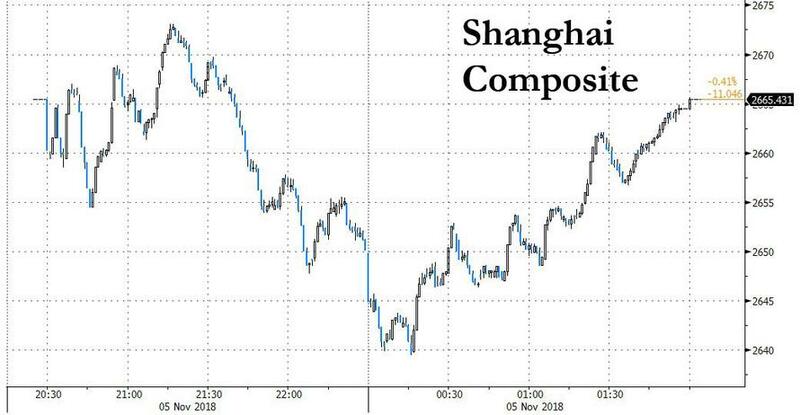 This is likely as a result of comments from US President Trump’s economic aide Larry Kudlow who cautioned against thinking there was the prospect of an immediate trade deal with China and that the White House wasn’t asked to draft a deal with China. Elsewhere, futures on S&P 500 (-0.39%) are pointing towards a softer open. Overnight, China’s October Caixin composite PMI came in at 50.5 (vs. 52.1 in last month) as the services PMI decelerated to 50.8 (vs. 52.8 expected) while Japan’s final October composite PMI came at 52.5 (vs. 50.7 in last month) and services PMI stood at 52.4 (vs. 50.2 last month). Elsewhere, the BoJ Governor Kuroda said that Japan is no longer in a situation where it’s best to be "decisively implementing a large-scale policy to overcome deflation," even as he added that the BoJ still needs to stick persistently with its stimulus program to achieve its 2% inflation target. He reiterated that the BOJ is aware of the downward pressure on commercial banks profitability and the risks to financial stability in the event of a large negative shock, owing to the BoJ’s stimulus program. Risk assets staged an impressive rally last week, with many of the recent underperformers reversing their trend to finish the week strongly. After a slow October, the S&P 500’s worst month since 2011, the US benchmark rallied +2.42% (-0.63% on Friday though with Apple -6.6%). Other US benchmarks also snapped their recent losing streaks with the NYFANG index up +2.79% (-1.87% Friday), the DOW up +2.36% (-0.43% Friday), and the NASDAQ up +2.65%, (-1.04% Friday). The Russell 2000 of small-cap US firms rose +4.32% (+0.19% Friday), for its best week since February. Equities outside the US also had a strong week, with the STOXX 600 up +3.33% (+0.28% Friday) for its best week since December 2016. The MSCI EM index gained 5.56% (+0.64% Friday), with the Hong Kong Hang Seng leading the way up +7.16% (+4.21% Friday), as news reports suggested that the US and China are approaching a trade détente. In fixed income, 10-year Treasury yields rose +13.7bps (+8.2bps Friday), as the strong nonfarm payrolls report (250k vs 200k expected) boosted sentiment on the US economy. Notably, 10-year real yields are now at their highest levels since February 2011 at 1.15% (+14.4bps last week and +5.0bps Friday), while breakevens were steadier at 2.06% (-0.7bps last week and +3.2bps on Friday). The dollar touched a fresh year-to-date high during the week, but retraced a bit to close only +0.19% stronger (+0.28% Friday), with its weakness in the latter half of the week partly driven by Chinese yuan strength amid the news of the potential trade reconciliation. The yuan gained +0.79% (+0.28% Friday) for its best week since March. Brent crude oil prices retreated -6.17% (-0.08% Friday) for their worst week since February, as the US granted sanctions waivers for eight countries, signaling that the administration will tolerate some degree of Iranian oil exports, consistent with the prior sanctions episode. Corporate earnings remain in focus, with 75% of S&P 500 having reported their results so far. Eighty-two percent of companies have beaten consensus expectations on profits, while 61.0% have beaten on revenue. Earnings growth is running at a +26.5% yoy pace in aggregate, quite a robust pace, while sales are growing at a +8.79% yoy pace. Some of the outlooks have been more negative than from recent quarters which has taken the shine of the good headline numbers. In Europe, 57% of STOXX 600 companies have reported, and 50.9% have beaten on earnings expectations, while 53.4% have exceeded revenue forecasts. In aggregate, STOXX 600 profits are up 13.1% yoy, on track for the best reporting season of the year but still a bit off the S&P 500’s blistering pace. We start the European session with the November Sentix investor confidence reading for the Euro Area and October ISM non-manufacturing print in the US. The ECB's Guindos is due to speak while Euro Area finance ministers are due to meet in Brussels with Italy high on the agenda. EU Chief Brexit negotiator Michel Barnier is also due to deliver a Brexit speech in Brussels, while China President Xi Jingping is due to address the country's first International Import Expo. Monday also marks the day that US sanctions on Iranian oil flows go back into effect.